Singer-songwriter Ingrid Ferris' debut solo album Traveling Saints & Angels is a music that emerges out of the rain and mist, inland waters and green forests of the Pacific Northwest. This flash point on the continent is where so many indie musicians have found their first footing, playing in grange halls, local brew pubs, cafes and dance halls. Ferris' music is as much a part of the NW landscape as the Icelandic or Irish genres are a part of theirs. This post-modern music is a weaving of song, sound, and spirit, with elements of the miraculous, moments of darkness, shards of shadow and light. The music invites the listener on a journey to experience in an entirely new way humanities dreams and stories, blending modern soul song, industrial gospel, with the sweet heart ache of longing and laughter. This is "Bridge Music"- fusing the inspiration from the past with the reality of the present to the potential of the future. 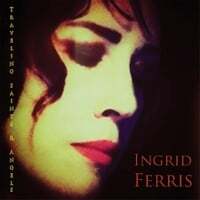 The Traveling Saints & Angels album's hallmark is Ingrid Ferris' authentic and passionate voice. This is a voice for our times - honed by jazz and classical training, and finely distilled in folk clubs, concert halls and songs by the camp fire. Ingrid's vocals soar, conveying a heart burning to express the indefinable harmonic of joy, as well as to invoke the haunted poignancy, that which whispers directly to the heart of love's yearning, to the unspoken apology, and to the forgiveness and redemption. And once you have listened to her songs, you will also begin to take note of the music arrangements, the musicianship, the engineering. This comes from the collaborative triune of Ingrid Ferris, Diane Sonntag, and Bruce Whitcomb ( see information below). Very few musicians create alone. Collaboration is usually at the core of contemporary music. And behold! Once in a Blue Moon a synergy happens, call it group genius, call it the hundredth monkey effect, but you get this phenomenon of a music creation that, by it's careful honesty, and mercurial genius, helps to define a generation. Watch and see, "make note to self": this music has that potential. And so we thank you for reading this and now ask that you take just a bit more time out of your busy day, sit back, get comfortable, and listen to this new music, a music that you've never heard before. * With the exception of 'Diamonds and Rust by Joan Baez and 'White Gull Rising' lyrics by Joe Illing.